I have another website called My Parent Magic that I'm also starting back up. On that site, I offer tips for helping parents keep the magic in their relationship with their children. 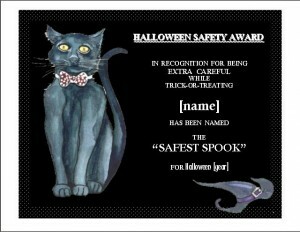 And I'm giving away some Halloween Certificates that you can use for your children, or if you're a teacher, bring them into your classroom. In addition, if you're interested in getting parenting tools, resources, and other freebies, you can sign up for that email list and get my ebook, “101+ Letters From” which contains over 100 letters you can customize for your children. There are Tooth Fairy letters, letters from Santa, and letters for special occasions like the first day of school. I used to sell this book, but I'm giving it away free to subscribers on the My Parent Magic site. Hope you can use these, and if not, please ignore this post! Thanks this will be great to have. Glad you like it, Heidi! I just have a short question. Why are computerized quilting machines so expensive? Hello Laurie – A lot of the cost for equipment like a computerized quilting machine comes down to software and supply and demand. Programming a machine to handle the intricate quilting patterns takes a lot of software engineering time, and because the quilting machines are not a commodity product, and not a lot of them are sold, the companies manufacturing these systems don’t get big breaks on the cost of materials. I didn’t realize those long arm machines were so expensive! Do all quilt shops have these services, or is more specialized?